I have been late in jumping on the Kale bandwagon as I really did not enjoy the taste of this vegetable very much. I have tried it a few times but other than Kale chips I did not fancy it. All this changed when I chanced upon this creamy, complex flavored Indian Style Curry made by Eat Healthy Eat Happy. 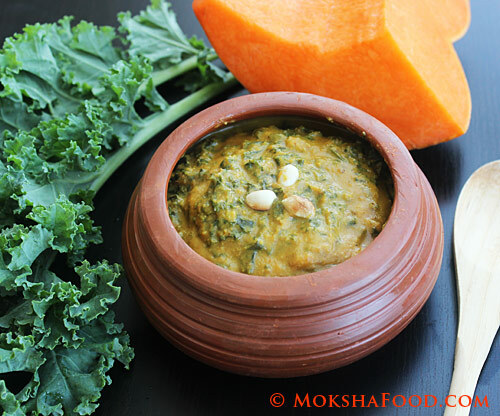 Kale and Pumpkin may sound like an unusual combination but they do pair well. The pumpkin adds a nice sweetness and creamy consistency to the curry. Indian spices add the heat and the depth of flavor making this recipe a treat for your taste buds. 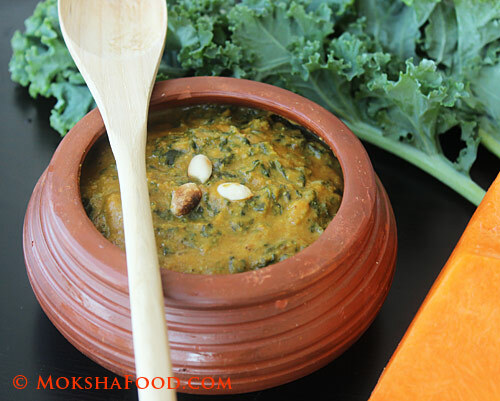 Here is my adapted version of this recipe which we loved so much that this will now be the "to go" recipe for Kale always. I served it with spiced raisin quinoa and Lebanese styled lentils for a power packed meal. Temper with cumin seeds and let them sizzle. Add in the onions and some salt and saute till soft. Then add in the ginger and garlic and saute for few more minutes. Drop in the pumpkin pieces, the peanuts and dried spice powders and coat the pumpkin well in the the spices. Pour the milk and cover the saucepan and let the pumpkin cook till soft. Take the mixture off the heat and cool slightly. Blend it all to a smooth puree with some more water if needed. Add the chopped kale to the pan and let it release water and reduce in size. Now add the blended paste back in and mix well. Taste for salt and add sugar too. Simmer this at a low heat for 15-20 minutes to let the flavors develops. Serve hot with flavored rice, quinoa or your favorite flatbread.